Home > Training > Breed > Large Dog Breeds: Is Bigger Better? Some of the breeds of dog that fall definitively in to this category include the Anatolian Shepherd, the Saint Bernard, the Newfoundland, the English Mastiff, the Great Pyrenees, the Great Dane, and the Irish Wolfhound. For the most part large dog breeds were bred to be working dogs, usually used to hunt larger animals, pull heavy carts or tow in fishing nets to fishing boats in frigid waters. As such working dogs these breeds developed large and muscular frames to enable them to perform their given tasks with ease. While most of these dogs no longer serve their original purpose they still maintain the characteristics that allowed them to excel at their work and as such they all require extreme amounts of exercise as well as mental stimulation to keep them happy and healthy. In general these breeds are all classified as gentle larges, dogs with sociable demeanors that are both hard working and family oriented. The Anatolian Shepherd generally stands between 29 – 36 inches tall as males and between 69-79 inches tall as females. The Anatolian Shepherd can weigh in anywhere between 90 – 150lbs with the males generally being larger than females. The Anatolian Shepherd has a thick double coat which is generally cream colored with brown patches and is wiry to the touch. The Anatolian Shepherd breed is particularly popular in Turkey where it serves as an independent livestock guardian, protecting farmer’s flocks of sheep from such predators as wolves, jackals, bears and cheetahs. As such the Anatolian Shepherd is a sturdy breed with a particularly thick coat which enables it to survive cold nights out in the fields. The Anatolian Shepherd is generally thought to live on average between 12-15 years with the dog usually succumbing to failing joints in old age, heart trouble or cancer. While 12 – 15 years may not seem like a particularly long life span for such a large breed it is significantly longer than other large breeds and is thought to be a result of the rugged nature of this dog. While an accomplished guardian of flock, the Anatolian Shepherd also tends to be a good guardian of its family and when raised with children and with an understanding of its position in the family an Anatolian Shepherd can make a good family and guard dog. The Anatolian Shepherd can be rather stubborn, however, and with an inexperienced owner or an owner who is not sensitive to the dogs exercise needs the Anatolian Shepherd can become destructive as well as dominant in the household. The Saint Bernard is a well known large breed following the movie series “Beethoven.” This large breed generally stands anywhere from 27 to 35 inches tall with the females generally measuring on the lesser end of the scale. Saint Bernard’s can weigh anywhere from 140 to 260lbs, again with the females of the breed weighing in at the smaller end of the scale. The Saint Bernard has a particularly thick coat which can be flat or rough and is a red-brown and white mixed color with black markings on the face. The Saint Bernard has a thick long tail. In general the Saint Bernard breed was bred as a mountain dog whose job was to rescue mountaineers from avalanches. When they are portrayed in the media the Saint Bernard generally has a barrel of brandy around its neck which was supposed to warm avalanche victims. On average the Saint Bernard breed has a lifespan of 8 years which is not uncommon for large dog breeds. 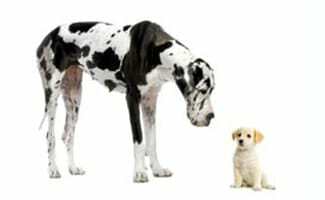 In general the larger a dog breed the more strain is put on their joints and organs to support the weight of the body. Unfortunately due to their size the Saint Bernard is prone to hip and elbow dysplasia, their size also poses a problem to them being family dogs. While the Saint Bernard is a gentle and family oriented dog it does not particularly realize its size and strength and often knocks down small children. The biggest complaint about the Saint Bernard breed is their clumsiness with smaller children or their slobbering habit, which can be found with many of the large dog breeds. 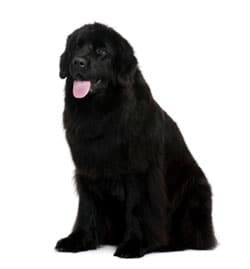 The Newfoundland generally stands at 22 – 28 inches at the shoulder and males can weigh anywhere between 130 – 150lbs and females can weigh anywhere from 100-120lbs. These large water dogs have particularly thick coats which require daily grooming and are usually black, brown, gray and landeer in color. Due to the fact that the Newfoundland were bred as a fisherman’s dog to retrieve fishing nets in the freezing waters of Newfoundland they have particularly thick and water resistant coats as well as webbed feet. These extremely strong dogs have thick bones as well as large lung capacities as a result of their intended purpose. A Newfoundland finds it hard to resist water even when it is not a working dog but its jowls, designed to allow the dog to breathe even while in the water, make this another breed that is particularly prone to slobbering. As a result of their immense size the Newfoundland is also another large breed that is prone to hip and elbow dysplasia as well as heart defects. On average the Newfoundland has a lifespan of 8-13 years with most dogs falling at the shorter end of the scale. The Newfoundland does well as a family dog but as with the Saint Bernard often knocks down smaller children since it is unaware of its large size and hefty weight. The biggest complaint about the Newfoundland aside from drooling and clumsiness with smaller children is their shedding. The English Mastiff is one of the most well known large breeds of dog and in general stands between 27-30 inches in height. The male English Mastiff can weigh anywhere from 150 – 250lbs and the female can weigh anywhere from 120-200lbs. The English Mastiff was originally bred as a baiting and fighting dog, however, over the years came to be used in more constructive ways for their size. The English Mastiff has a short and close coat that is apricot-fawn, silver-fawn, fawn or dark fawn-brindle in color and always has black markings on the face on the muzzle, ears, nose and around the eyes. Due to their immense size the English Mastiff succumbs to quite a few health problems including hip dysplasia, gastric torsion and various cancers. The average lifespan of an English Mastiff is between 7-13 years with most dogs falling at the lower end of the scale due to poor breeding and sheer size. The English Mastiff is generally a good family dog; however, as is the common complaint with similar large breeds the English Mastiff is known for being clumsy with small children, and for drooling excessively. They are, however, generally good temperamented dogs and the epitome of the gentle large. The Great Pyrenees is often confused with being a white Newfoundland; however this large breed is a breed in and of its own. The Great Pyrenees male can stand anywhere from 27-32 inches tall and the female can stand anywhere from 25-29 inches tall. The male Great Pyrenees weighs on average anywhere from 110-120lbs and the females anywhere from 80-90lbs. The Great Pyrenees has a thick and fluffy white coat with jet black eye rims and nose. The Great Pyrenees dogs were originally bred as shepherd dogs to guard flocks in the Pyrenees Mountains in France and Spain. The white coat of the dog enabled it to guard effectively and remain disguised against the snow, the thick coat also managed to protect the large dog from the colder temperatures. In general the Great Pyrenees lives between 10 – 12 years and despite being hardy dogs they often succumb to dysplasia from poor breeding or joint and organ wear and tear from the sheer weight of their large frames. The Great Pyrenees, being shepherds by nature make particularly good family dogs, however, they do not thrive in warm temperatures and are known for being heavy shedders. The Great Dane is certainly known for being one of the tallest large breeds in the dog world and on average the male Great Dane should measure 30 inches or more at the shoulders and the female Great Dane should measure 28 inches or more at the shoulders. The male Great Dane should weigh on average 120lbs while the female should weigh around 100lbs. This large dog was originally bred for German hunting dogs, however, generally served as house dogs at the time. These large dogs can have a variety of coat colors and their short, close coats are generally fawn, brindle, blue, black, harlequin, or mantle in color. While the Great Dane is not known for being a big shedder it is certainly known for being a big drooler as well as a big leaner. Due to the fact that this is such a large dog that likes to lean it generally does not do as well in households with younger children since they tend to get knocked down easily. The Great Dane does, however, have a great temperament and is well suited to family life. The Irish Wolfhound is a lesser referred to large breed of dog, however, males generally standing between 34-38 inches and females generally standing at 30-35 inches, certainly qualify as a large breed! This large wiry coated breed was originally bred to hunt wolves in Ireland and have been shown in art from years as early as 273BC. These large but nimble hounds are particularly talented at running and certainly cannot be happy without adequate exercise. The Irish Wolfhound is usually gray, brindle, black, red, white or fawn in color; however, they are usually dark gray when depicted in the media. The Irish Wolfhound has a particularly short lifespan even for a large breed of dog with lifespan estimates coming in anywhere from between 5-10 years. The Irish Wolfhound generally succumbs to heart defects or bone cancer and is also particularly susceptible to epilepsy. As a family dog the Irish Wolfhound thrives with contact from its people and is not suited to being left alone for long periods of time. Irish Wolfhound’s are unusually aware of their size when young children are present in the household and they are generally gentle and subdued dogs inside the home. The black Russian terrier is not a dog that is commonly seen on the street, this giant breed is a rare find and a powerful dog. The black Russian terrier male grows to anywhere from 25 to 29 inches tall and the female grows to anywhere from 25 to 28 inches tall. These large solid black dogs can also weigh in at anywhere from 80 to 143 lbs with the males being considerably larger than the females. The black Russian terrier is a strong dog that is recognized for having a good nervous system. The most commonly recognized feature in this schnauzer looking dog is the mustache and beard that give the snout of the dog a square appearance. This terrier is a brave dog that is suspicious of strangers and very protective over its people. This breed of dog is particularly demanding of human contact and requires a strong owner who both values and has a firm alpha position over all animals in the household. This giant breed has a relatively long lifespan of between 10 and 14 years. The most common health problems with this large breed are hip dysplasia, elbow dysplasia and otitis. The borzoi, also known as the Russian wolfhound is a dog that was bred by Russian nobility by crossing sheepdogs with greyhounds. As a result of this cross breeding the breed has a sheepdog like coat with the body shape of the greyhound. The long and silky coat of this breed is relatively easy to care for but it does demand a degree of care. The male borzoi tends to grow to around 28 inches tall or more and the females to 26 inches tall. Males will weigh in at around 75 to 105 lbs and the females will weigh in at between 60 and 90 lbs. These deep chested dogs can be a variety of colors but commonly they are tan, black, white, tan or grey with black markings or golden. These dogs are intelligent and very loyal to their people “pack” but they do not take well to rough play which makes them less than desirable as a dog for a family with young children. The borzoi needs a firm owner who is patient and willing to dedicate time to training as this breed is not as driven to please humans as many other breeds are. By nature these dogs are sight hounds and will chase after most things that they see so they do not do well off leash and should always be supervised with small pets. The borzoi is prone to canine bloat and is particularly sensitive to drugs which can pose problems when veterinary care is needed. This giant breed tends to life for an average of 10 to 12 years. The greater Swiss mountain dog is a large and muscular dog developed from the Roman mastiff for a number of working jobs. This large breed was commonly utilized as a “horse,” being used as a draft dog in addition to being used for guarding and herding livestock. The greater Swiss mountain dog was also commonly used as the sentinel for farms. This giant dog is classified as a working dog and a mastiff and can grow to anywhere from 23.5 to 28.5 inches. The weight of these incredibly large dogs varies anywhere from 130 to 135lbs. Like many of the other giant breeds, the greater Swiss mountain dog has a deep chest which unfortunately leaves it prone to bloating. This dog is specifically recognized for its unique tri-color coat with a black base and rust and white markings which are specific to the breed. Even though the greater Swiss mountain dog is a giant breed it is an excellent dog when it comes to interacting with children, they are easygoing, sweet and eager to please. This breed makes an excellent watchdog as they bond quickly to their family and is sensitive to changes in its home. The greater Swiss of Swissy as it is sometimes called has the potential for a number of health conditions including epilepsy, bloat, hip dysplasia, digestive disorders and having extra eyelashes. This giant breed has an average lifespan of 10 to 11 years. The Kuvasz is another giant breed that is certainly not spoken of as often as many of the more common giant breeds. This giant breed, also known as the Hungarian kuvasz actually originated in Tibet but was further developed in Hungary where it was used as a sheepdog and protector of the flock. The kuvasz is a fearless dog that can be found with only a white or ivory coat that can be wavy or straight but is always thick. Due to the thickness of this dogs coat it does not do well in hot climates. 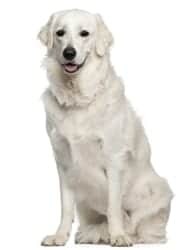 The kuvasz can make a good family dog but it is not a dog that can make do with minimal exercise. This giant breed demands an experienced owner who is firm and authoritative and it is best to have the dog raised around children for the best results as a family dog. This is an extremely dominant dog and owners cannot be lax in training them. The male kuvasz can grow from 28 to 30 inches tall and the female can grow from 26 to 28 inches tall. The males are also heavier than the females weighing in between 100 and 115 lbs where the females weigh from 70 to 90 lbs. This large breed can suffer from hip dysplasia, osteochondritis dissecans, hypertrophic osteodystrophy, allergic reactions and skin problems. The average life expectancy for this giant breed is between 10 and 12 years. The Bernese mountain dog stands between 23 to 28 inches and weigh in between 80 to 110 lbs. Females of the breed most often smaller than the males. Originating in the Swiss Mountains, these working dogs were used to pull carts to market as well as drive cattle and secure family farms. Many of the original traits of this breed still exist today and these dogs excel in search and rescue, carting, herding, watch dog, tracking, guarding and competitive obedience work. The Bernese mountain dog is considered a member of the AKC working group of dogs and as a mastiff breed. This large breed has a thick weather resistant coat that is tricolor with white, black and rust coloration. The long coat of this breed requires frequent brushing. This is a seasonally heavy shedder. This is an easy to train large breed but does require a good leader in order to become a psychologically healthy dog. The Bernese mountain dog does require “family time” with its people and must be well socialized from an early age. In order to keep energy levels and behavior in check, this breed requires regular exercise which can be tricky during warmer months when the Bernese is overly sensitive to hotter temperatures. The average lifespan of the Bernese mountain dog is between 6 to 8 years, much lower than it once was at 10 – 12 years. The most common health conditions for this breed include bloat, cancer, hip and elbow dysplasia, obesity and eyelid conditions. 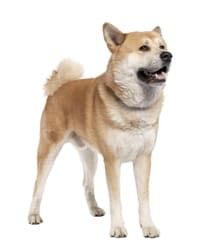 The coat of the akita inu is a double coat with a thick but soft undercoat that keeps the dog insulated and a rough waterproof outer coat that protects the dog from the elements. Colors for the American akita are various and include: pinto, brindle and white and all but the white may have a mask. Colors for the Japanese akita include: pure white, sesame, red, fawn and brindle. The akita requires vigilant grooming and sheds twice a year heavily. Akitas are calm and intelligent breeds but can be very hardheaded if not provided with solid leadership. It is important to allow this dog a regular exercise routine not only for physical but also for mental health. The average lifespan for this breed is between 11 and 15 years. Common health concerns for the akita include: hip dysplasia, thyroid conditions, skin conditions, knee problems, immune diseases and eye conditions. The long shaggy coat of this breed is a double coat with a soft undercoat that protects the skin from water and a rough outer coat. Common coat colors for this breed include blue, grizzle, blue grey, grey, grey with white markings, blue merle or white with grey markings. The coat of this breed demands constant attention in order to prevent mattes and skin infections as well as parasites. Many people that own pet old English sheepdogs have their dogs shorn every few months to help with coat maintenance. This large breed is particularly active and requires a significant amount of exercise in order to keep in shape. It is also necessary that this dog receive leadership from a strong human leader. The average lifespan of this breed is between 10 and 12 years. Common health conditions that affect this dog include: hip dysplasia, anemia and a genetic sensitivity to certain drugs. The Scottish deerhound stands between 28 to 32 inches tall and weighs in between 75 to 110 lbs. With a similar body shape to the greyhound this large breed was at one time the dog of royals. In Scotland, no one with less than an Earl’s title was permitted to own one of these hounds. These dogs were bred for and used to hunt deer for a long period of time until guns were invented. Numerous times throughout its history the Scottish deerhound has been close to extinction. Today the breed has managed to maintain its existence and is renowned for its sense of sight and its sense of smell. Some of the activities that these dogs are known to excel in today include: tracking, sighting, agility, racing, hunting and lure coursing. The Scottish deerhound is a gentle and sociable dog that requires consistent and firm leadership to overrule their natural hardheadedness. The coat of the Scottish deerhound is wiry and is shorter in length on the chest, head and belly. This dog comes in grey, blue grey, yellow and sandy red, red fawn, brindle and black. The coat of this dog is wiry and needs to be groomed regularly to avoid knotting. Due to the wiry nature of the hair this dog is an average shedder. This is a breed that demands a regular exercise schedule and a stern but calm owner. The average lifespan of this breed is under ten years. Health concerns that face this breed most commonly include: bloat and epilepsy. The Tibetan mastiff stands between 25 to 28 inches tall and weighs in between 140 and 170 pounds. Despite being named “mastiff” these dogs look considerably different than many of the other dogs that bear this name. Most notably the Tibetan mastiff has a thick double coat that makes the dog appear much larger than it actually is. This double coat is particularly thick around the dog’s neck and gives it the appearance of having a mane. These dogs come in blue gray, brown or black with various colored markings. Originally used in the Himalayan Mountains these dogs are built for colder weather. 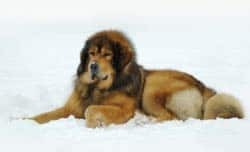 The Tibetan mastiff makes a great guard dog as well as livestock guardian but it is a strong willed dog that demands an experienced and firm owner to give it leadership. These dogs do well as family dogs but require regular exercise as well as regular grooming. While good dogs for allergy sufferers, the Tibetan mastiff will “blow” its coat twice a year and during this time it must be brushed daily to remove dead and shedding hair. The average lifespan of this dog is around 15 years old and common health concerns include: hip dysplasia, canine inherited demyelinative neuropathy, skin conditions and ear infections. The Neapolitan mastiff stands between 24 and 30 inches tall and weighs as much as 165 pounds. Unlike the Tibetan mastiff, the Neapolitan mastiff has a much more “mastiff like” appearance with the smooth coat and wrinkled facial appearance and large jowls. The coat of this breed is short and dense and can come in a number of different colorations including: tawny, mahogany, chocolate, gray, black, blue and brindle. The rarest of Neapolitan mastiff colors is chocolate. As with most mastiff breeds, the Neapolitan mastiff is a heavy drooler and as such it is not the dog for everyone. While they look vicious, the Neapolitan mastiff is a very calm and affectionate breed. Simply due to their size it is important to socialize these dogs well and provide them with dominant leadership. The Neapolitan mastiff that believes that he or she is pack leader can have a number of behavioral concerns. These dogs are natural guard dogs and are serious and intelligent by nature. Neapolitan mastiffs require plenty of exercise but do not thrive in warm weather. Due to their size these dogs have a particularly short lifespan of around 10 years. Common health concerns include: hip dysplasia, bloat, joint pain and cherry eye. The dogue de Bordeaux is also known as the French mastiff and stands between 23 to 30 inches tall and weigh between 120 to 145 pounds. Much like the Neapolitan mastiff this breed has the typical physical characteristics of the mastiff family. The coat of the dogue de Bordeaux is short but not coarse and it features loose skin folds giving it a wrinkled appearance. Dogs of this breed are always a shade of reddish brown that falls between fawn and mahogany. The dogue de Bordeaux always has a face mask that is black or red in color. This calm and loyal dog demands an experienced dog owner who can lay down the rules and enforce them. It is also important that this breed be well socialized from a very early age in order to prevent aggressive behavior in adulthood. This large breed demands more daily exercise than the Neapolitan mastiff and must also be provided with plenty of mental stimulation to avoid problem behaviors. This natural watch dog has an average life span of 10 to 12 years. Common health concerns in the dogue de Bordeaux include: hip dysplasia, heart conditions, hyperkeratosis and epilepsy. The bullmastiff stands between 25 to 27 inches tall and weighs in between 100 to 135 lbs. Commonly confused with the English mastiff, the bullmastiff has a similar appearance but results from the cross breeding of the English mastiff and the old English bulldog. The bullmastiff hails from Europe and features a short, dense and rough coat where the English mastiff has a short but fine coat. The bullmastiff is a minimal shedder and does not require frequent grooming. The coat of this breed comes in brown and red coloration where the English mastiff is silver and black and tan in color. The bullmastiff is a quiet but intelligent breed with an independent streak. Although independent however, these dogs are fiercely loyal to their families and make great watch dogs. As with all mastiffs however, it is crucial for this breed to receive firm and authoritative leadership. Bullmastiffs must be well socialized from an early age in order to prevent aggression. In order to maintain a well behaved bullmastiff, it is also important for this breed to receive regular exercise. Unfortunately, this large breed has a particularly short lifespan of less than 10 years. Frequently seen health conditions in this breed include: hip dysplasia, bloating, cancer, eye conditions, obesity and tumors. The briard stands between 24 to 27 inches tall and weighs in at around 75 pounds. This breed is recognized by many for its long wavy coat. The double coat of the briard features a fine undercoat with a course outer coat. Common colors for this breed include grey, tawny and black. The coat of this breed is fluffy in appearance and longer hair around the muzzle and eyes give this dog an old man type appearance. Naturally a herding dog it is important to provide socialization and training early for this breed in order to reduce herding behavior with family members and other animals. A very affectionate and intelligent breed, the briard is loyal to its family and fearless when it needs to be. This dog requires both firmness as well as a gentle hand when being trained. Easily bored, the briard requires regular exercise and stimulation to prevent troublesome behavior. The average lifespan for this large breed is between 10 to 12 years. Common health concerns for the briard include: hip dysplasia, bloat, progressive retinal atrophy and cataracts. The Akbash dog is also known as the Coban Kopegi and is a rare breed native to what is now Western Turkey. This breed made it first appearance around 3,000 years ago when it was bred to guard sheep and it is believed to be a relative of the Komondor and Kuvasz. This dog stands anywhere from 28 to 32 inches tall and weighs in between 90 to 130 pounds. The Akbash has a medium length double coat that does not matt and is weather resistant; this coat is always white in color. A very muscular breed, the Akbash requires experienced owners who understand how to be a dominant member of the pack hierarcy. The Akbash is recognized as a “primitive” breed meaning that it is more accustomed to working solitarily than it is used to being a family dog. It is crucial that this dog receive plenty of exercise as well as socialization in order to make sure that the dog is well adjusted. It is important to note that as a primitive breed, the Akbash is naturally aggressive since it is meant to stand up to flock predators, this is why a dominant and experienced owner is required. The biggest health concern for this breed is hip dysplasia so it is important to purchase from certified stock. The average lifespan of this breed is around 10 to 11 years. The Leonberger was established as a breed in 1846asa dog that would resemble the lion in appearance. A popular and versatile German breed, the Leonberger is known for its ability to guard livestock, participate in search and rescue and work in tracking. This breed is also commonly recognized for its popularity as a family dog. The Leonberger gros to between 27 and 31 inches tall and can weigh anywhere from 100 to 170 lbs. The Leonberger is a large and muscular dog and has a medium to long thick coat. This double coat is water resistant and can be golden, red, lion yellow, red brown, pale yellow, cream or sand but the dog should always have a black mask. Male Leonbergers have thick manes that develop over the years, females have much smaller manes. As a larger breed, the Leonberger require a long daily walk and are avid swimmers. This breed is a naturally brave and affectionate one and they are known for being devoted completely to their families. Friendly and trustworthy these dogs are not great guard dogs and in most instances they will walk away from situations rather than face them with aggression. Although patient, the Leonberger requires a firm trainer and leader who understands that this breed does not respond to harsh training. 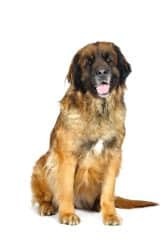 The Leonberger is prone to hip dysplasia and bone disease and has an average lifespan of 8 to 9 years. The Tosa is a Japanese breed that was unfortunately bred as fighting dogs when the sport was popular and legal in the country. This is not a common breed in the United States and has been banned in a number of countries due to the use of the breed in dog fighting in illegal dog fighting rings. When handled and trained well this breed can make a great family companion as well as a great watch dog. This member of the Mastiff family grows to around 24” tall and weighs around 80 to 200 lbs. Variations in weight seem to stem from U.S and Japanese breeds of this dog. A very muscular breed, the Tosa has a short thick coat that is brindle, solid or multicolored. Multicolored coats are fawn, apricot, black, yellow, black and tan, black and brindle or red in color. Often this dog also has a black mask. Despite being known as a fighting breed, the Tosa is sensitive dog when it comes to training and requires a firm and authoritative leader who is also calm in nature. Socialization and training must begin as early as possible for this breed in order to ensure that the dog is well trained. The Tosa can have problems with other animals in the home so early animal socialization is also crucial. This breed requires a long daily walk or jog to burn off excess energy and avoid obesity. The Tosa breed is prone to bloating, hip and elbow dysplasia and genetic eye conditions. The average lifespan for this breed is around 10 to 12 years. The Native American Indian dog is a controversial dog for many because while some claim that this breed is a recreation of the dogs most commonly used by Native Americans; others claim it is a creation of breeders. Regardless, this dog breed has two distinct variations. A long haired NAID and a short haired NAID both of which can range in color including: silver, black and tortoise shell coloration. The NAID coat resembles that of a husky or in the longer haired breeds, the sheltie. The NAID grows to around 23 to 34 inches tall and can weigh anywhere from 55 to 120 lbs. A very intelligent breed, the Native American Indian Dog is easy to please its companions and is protective of them at the same time. This is a particularly sensitive dog breed that should not be trained with a firm hand, rather an authoritative leader. Socialization is important with any dog but the NAID is naturally good with children as well as other animals as long as it understands its position within the pack. This breed does not do well living in confined spaces such as apartments, and they also do not do well with crate training because they are “wanderers” by nature. A large yard to play in, daily walks and off leash running are great ways to allow this dog to burn off excess energy. The NAID sheds once a year during which time the coat should be thoroughly brushed. The most common health condition for this large breed is hip dysplasia. The average lifespan of the Native American Indian dog is 14 to 19 years. The Weimaraner is a descendent of the bloodhound and was bred as a hunting dog and a pointer. This dog was initially bred to hunt large game like wolves and deer but today they are more often used as bird dogs and for retrieving. The average size of this breed is between 22 and 27 inches tall with a weight of 50 to 70 lbs. males are almost always larger than females. The coat of the Weimaraner is short and smooth and comes in a range of gray shades. There is such a thing as a long haired Weimaraner; however, it is a much rarer variation of the breed. The eyes of this retrieving dog are gray, amber or blue-gray. The Weimaraner is an affectionate breed that learns quickly but requires adequate exercise in order to prevent troublesome behavior. This breed should be socialized from an early age and should never be trusted alone with smaller animals due to their natural hunting instinct. This dog demands a strong leader. The Weimaraner is prone to bloating, tumors, excessive rapid growth and hip dysplasia. The average lifespan for this breed is between 10 to 12 years. The Vizsla is also known as the Hungarian Pointer and was originally developed as hunters used for hunting rabbit and waterfowl. The Vizsla has a short coat that is a variety of gold shades. 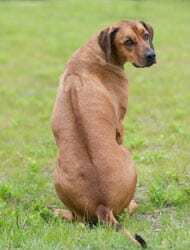 It is common practice for this breed to have a docked tail; however, tail docking has been outlawed in many areas. The Vizsla grows to between 20 and 26 inches tall and weighs between 40 and 60 lbs. This is a gentle dog that requires a patient but firm leader and plenty of exercise. This breed is particularly active and as such it may not make the best companion for homes with smaller children. Without an appropriate level of exercise the Vizsla can become extremely destructive, in particular they are noted for being chewers. The Vizsla is prone to hip dysplasia and has an average lifespan of between 12 and 15 years. The standard poodle has a somewhat mysterious origin with no real record of the country of origin. Many people say that this is a water retrieval dog that hails from Germany. The standard poodle is very fond of the water but has also been used as a gun dog. 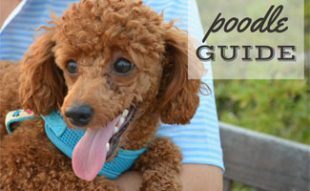 The standard poodle can have a curly or a corded coat that comes in a number of solid colors including white, brown, black, blue, apricot, red, silver and gray. A large part of the poodle’s coat is the clip given by professional groomers. This breed can measure in at anything over 15 inches tall and can weigh between 45 and 70 lbs. The standard poodle is a cheerful dog and does not have extreme exercise requirements. It is important however to give this breed adequate exercise daily in order to avoid the dog becoming highly strung. This breed requires a firm but calm leader and excels as a family oriented dog. Despite being a long lived breed, the standard poodle is susceptible to a variety of health conditions including bloat, Von Willebrand’s Disease, cataracts, allergies, hip dysplasia and runny eyes. The average lifespan for this breed is between 12 and 15 years. The Spinone Italiano is a lesser known large breed of dog that is also known as the Italian pointer. This breed is still not too common in the United States; however, it is frequently seen in Italy where it is used as an all around hunting dog. The Spinone Italiano excels at retrieving and recovering game due to its incredible sense of smell. This breed stands between 22 ½ to 27 ½ inches tall and weighs anywhere from 61 to 85 lbs. The Spinone Italiano has a thick wiry coat that comes in a variety of colors including: white with brown markings, orange roan, orange roan with orange markings, white, white and orange, brown roan and brown roan with brown markings. This is an incredibly strong dog that is both intelligent and easy going. This breed excels with children as well as other animals; this friendly nature makes this a poor breed choice for those looking for a protective dog breed. It is crucial that this breed understand its position within the family hierarchy in order to be a well rounded dog. Hip dysplasia can be a concern with this dog, as can cerebellar ataxia. The average lifespan of this breed is 12 years. 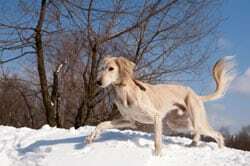 The saluki is also recognized as the Persian greyhound. This breed requires a lot of exercise in order to maintain both physical and psychological fitness. It is important not to let this sight hound off leash at any time due to their chasing instinct. The Saluki was bred as a sight hunter and was frequently utilized as a hunter of antelopes and hare in rough desert terrain. This slender dog has a greyhound type build with a deep chest and a long neck. This breed has a short coat that features longer silky hair on both the ears and tail. Common coat colors for the saluki include white, black and tan, grizzle and tan, golden, cream and fawn. This breed can grow to anywhere from 23 to 28 inches tall and can weigh anywhere from 29 to 66 lbs. This breed is a very devoted one that tends to attach itself to a single leader who should be firm but gentle in teaching obedience. This breed is easily distracted and requires consistent leadership. This is a sensitive dog that does not do well with roughhousing that younger children can sometimes bring. This dog is a good watchdog breed. As an instinctive hound they should not be trusted with smaller animals. This breed is prone to cancer as well as genetic eye diseases. It is also important to know that the Saluki is easily sunburned and should be protected from direct sun exposure. The average lifespan of this breed is 10 to 12 years. The giant schnauzer hails from Germany and was primarily used as a police and military dog as well as a cattle driving dog in Bavaria. This herding breed stands between 23 and 28 inches tall and weighs in between 55 and 105 lbs with the males being larger and heavier than the females. The giant schnauzer has a double coat with a softer undercoat and a wiry top coat that is either salt and pepper or solid black in color. These dogs often have longer hair around their whiskers, beard and eyebrows. These are exceptionally intelligent dogs but can naturally be quite dominant and so require a confident and stern handler. It is crucial that this breed receives plenty of exercise since they are very energetic and need an outlet for that energy in order to avoid behavioral issues. These giant dogs are prone to cancer, bloating, hip dysplasia and epilepsy. The average lifespan for this breed is between 12 and 15 years. The otterhound is believed to be a French breed in origin and is so named due to the fact that they were used to prey on otters that were stealing fish from local rivers. This large breed grows to between 24 and 26 inches tall and weighs between 66 and 115 lbs. The otterhound is known for having an exceptional sense of smell as well as a rough shaggy coat. The outer coat is rough but the undercoat is water resistant and soft. The coat of the otterhound can come in a variety of colors including grizzle and wheaten with black markings. This is another breed recognized for having the appearance of having shaggy eyebrows. This breed has webbed feet and is known for being particularly strong swimmers that will even dive when looking for a perceived prey item. Although the otterhound can give the appearance of being a calm companion it does require a consistent and determined owner in order to avoid behavioral issues. The otterhound requires plenty of daily exercise as well as regular grooming in order to prevent matting of the fur. Health concerns for the otterhound include hemophilia, bloating, hip dysplasia and thrombocytopenia. The average lifespan for this breed is between 10 and 12 years. The plott hound is a breed with American ancestry that resulted from the breeding of bloodhounds and curs in North Carolina. A little smaller than some other large breeds, the plott hound tops out at around 24 inches tall with a minimum height of 20 inches tall. This breed weighs between 45 and 55 lbs but this can also vary greatly based on height and breeding. The plott hound’s coat is short and glossy and can range from a single to a double coat depending upon breeding. The most common coloration for this breed is a brindle black and brown coloring but they can also be solid black, brindle with a black saddle, buckskin and black with a brindle trim. These dogs make great hunters as well as companions but require early socialization and obedience training early on from a confident handler. This breed requires plenty of exercise and is known for drooling like many hounds are. The plott hound is prone to bloating and has an average lifespan of 12 to 14 years. Bred in the German town of Rottweiler, this large, heavily built breed had many applications including police work, messenger dog work, guard dog work, herding and draught dog work. This mastiff breed has a smooth and glossy coat that is rough to the touch and is always black with mahogany markings on the legs, paws, muzzle and cheeks. It is also possible to have a red Rottweiler with brown markings however, these are seldom seen over their black and mahogany counterparts. This muscular dog stands between 22 and 27 inches tall and weighs between 85 and 130 lbs and requires plenty of exercise. Daily walks for this breed are a must in addition to other “playtime” activities to burn off energy. The Rottweiler requires a natural leader willing to begin training and socialization early on in order to develop a dog with a well rounded personality. The Rottweiler is prone to entropion, snoring, hip dysplasia, ACL damage and overeating (obesity.) The average lifespan for this breed is between 10 and 12 years. The Rhodesian ridgeback is native to Zimbabwe where they worked as guard dogs and hunters. Once the dog was introduced to Rhodesia it became known for its ability to hunt big game such as lions which is how it also became known as the African lion hound. This hound is a very muscular dog with a long tapering tail and a short coat that features a ridge along the back where the fur grows in the opposite direction of the rest of the coat. The Rhodesian ridgeback’s color varies and includes lighter wheaten colors to darker shades of red. While known for their hunting ability, the ridgeback is a calm family dog that is both gentle and obedient. These dogs must be handled by strong and confident owners that can enforce rules of the home. Without appropriate handling, the ridgeback can be stubborn but with a good master it will learn quickly. It is important to socialize this breed from an early age and to be consistent in obedience training. This is a very energetic breed and requires daily runs as well as intellectual stimulation to prevent problem behavior. While few dogs are known for being more destructive than bored Labradors, Rhodesian ridgebacks are when not given enough stimulation! Although a hardy breed health-wise, the ridgeback is susceptible to cysts, hip dysplasia and dermoid sinus. The average lifespan for this breed is between 10 to 12 years. The Beauceron is also known as the Berger de Beauce, Bas Rouge, Red Stocking and Beauce Shepherd. This breed is a French herding breed that has been recorded as far back as 1578. This dog stands between 24 and 27 ½ inches tall and weighs as much as 100 pounds. In general this breed is both brave and intelligent but much receive adequate stimulation in order to receive enough physical and mental exercise. Without adequate exercise this breed can be very destructive and turn to herding its human family. The Beauceron has a short double coat with a harsh outer coat and a softer undercoat. This dog can be black with tan markings or may also have patches of gray, black and tan. Although a generally healthy breed, the Beauceron is prone to hip dysplasia and bloat. The average lifespan of this large breed is between 10 and 12 years. The Belgian sheepdog is also known as the Belgium Shepherd, Belgian Shepherd Groenendael, Belgian Groenendael, Chien de Berger Belge and the Groenendaeler. This breed is a high energy working dog that hails from Belgium and is one of four known Belgian sheepdogs. This herding and guardian breed stands between 22 and 26 inches tall and weighs between 60 and 75 pounds. This is the most popular breed of all of the Belgian sheepdogs but it is imperative that you understand what it means to be a leader to your dog when bringing one of these dogs in to the home. This is an exceptionally intelligent breed that should be trained and socialized from a very early age. The Belgian sheepdog has a weather resistant coat that is of medium length and has a thicker mane around the neck. Most often this dog is solid black in coloration but may also have a small amount of white coloration on the chest. The most often seen problems with this large breed include: temperament concerns, hip and elbow dysplasia and obesity. The average lifespan for this breed is between 13 to 14 years. The Belgian tervuren is also known as the Belgian Shepherd Malinois, Tervuren and Chien de Berger Belge. Like other Belgian sheepdogs, the Belgian tervuren is a working breed that hails from Belgium, more specifically the village of Tervuren. This herding breed stands between 22 and 26 inches tall and weighs between 60 and 75 pounds. It is crucial to socialize this breed well and train from an early age as they are instinctively protective and need to be directed and taught appropriate versus inappropriate behavior. The coat of the Belgian tervuren is a weather resistant double coat with long guard hairs and a thick undercoat. Coat colors can be various shades of gray as well as fawn to mahogany. It is not unusual for the coat of this breed to become darker as the dog ages. Minor health concerns for this breed include skin allergies, hip and elbow dysplasia, obesity, eye problems and epilepsy. The average lifespan of this breed is between 12 and 14 years. The Belgian malinois is also known as the Belgian Shepherd Malinois, the Malinois, the Chien de Berger Belge and the Mechelse Shepherd. Named after the Belgian city of Malines, this breed was bred as a sheepdog and is relatively rare in the United States. This large working dog stands between 22 and 26 inches tall and weighs between 55 and 65 pounds with females being smaller than males. This breed has a weather resistant double coat that is straight and short and held closely to the body. Coat colors are fawn, red, mahogany and black – all hairs have black tips. This breed also has a black mask and ears. This is a protective and territorial dog that requires socialization and training from an early age. This breed as with other working dogs requires plenty of exercise. Although a relatively healthy breed, the Belgian Malinois is prone to skin allergies, disposition concerns, hip and elbow dysplasia and eye conditions. The average lifespan for this breed is between 12 and 14 years. The German Shepherd is also known as the Alsatian and the Deutscher Schaferhund. This breed was originally developed in Germany as a herding dog and currently is one of the most popular working dog breeds. The German Shepherd stands between 22 and 26 inches tall and weighs between 75 and 85 pounds. This working dog can have a double coat, a plush coat and a longhaired coat that can come in black and tan, sable or all black coloration. Other colors are generally not accepted for this breed. The white German Shepherd is considered a breed of its own. A courageous and alert dog, the German Shepherd is a high energy breed that requires adequate exercise to avoid destructive behavior. 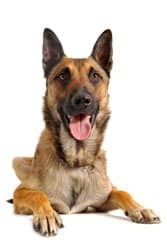 Due to irresponsible breeding patterns a number of hereditary diseases have become prominent with the German Shepherd breed including: epilepsy, digestive trouble, blood disorders, hip and elbow dysplasia, Von Willebrand’s disease and degenerative myelitis. The average lifespan for this breed is 13 years. The Chesapeake Bay Retriever is also known as the Chessie or the Chessy Dog. This breed began with the mating of Newfoundland’s and retrievers and eventually became a breed of their own used to hunt waterfowl in the Chesapeake Bay. This breed stands between 21 and 26 inches tall and weighs between 55 and 80 pounds. This is not a dog designed for apartment living and has a need for regular exercise. This breed also does not do well in hotter climates. The coat of the Chessie is oily, coarse and rough, it is also water resistant and has a wave to it. The most common colors for this breed are red, brown, tan and sedge and they may sometimes have a small white patch. This breed also has a particular odor to its coat that is distinguishable to other Chessie owners. Unfortunately this breed is prone to hip dysplasia and eye problems. The average lifespan for this breed is 10 to 12 years. While certainly not all of the dogs that fall in to the large dog breed category are listed here, some of the most recognized and popular large breeds of dog are. 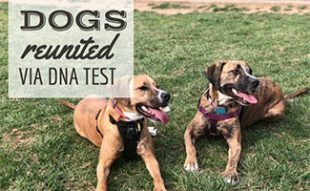 It is true that for the most part these dogs have stereotypes attributed to them, but as a responsible dog owner, it is your job to assess the temperament of each individual dog and assess its compatibility with your specific needs. While certain dogs may generally be good with children one particular dog of that specific breed may not be as good with children; just like people, dogs differ in temperament as individuals. Aside from assessing a dog’s personality to match it to your own family it is also important to assess the needs of a large dog breed when bringing one in to a family life. Large breeds of dogs are certainly more expensive to feed and are much more work when it comes to exercising. Without being devoted to providing a quality diet and a thorough exercise routine to your new large breed dog’s life, it is pointless to even attempt to bring such a large dog in to your home. A tired dog is a happy dog; a bored dog is a destructive dog. Looking at my 3 mastiffs all over the age of 15, and all over 230 pounds and thinking that the person who wrote this article really knows NOTHING about english mastiffs. 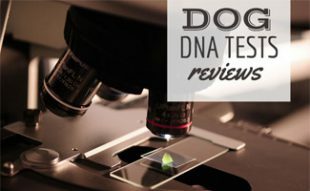 We collected our data for this article from reputable sites like the American Kennel Club. This data is not black and white, these are the average ages and weights for dogs as well as some other information. It’s great that your dogs have lived past 13 years old and weighing over 230 pounds isn’t out of the ordinary for animals this size. Is there something that is incorrect for the English Mastiff section that we have in our article? It is helpful when our readers explain what they are disagreeing about. We are all for constructive criticism but remember behind the computer screen we’re all dog lovers and people too. 🙂 If you’d like, you can share the characteristics you find in your english mastiffs as well as other features. I’m sure our readers would love reading about your three dogs as well as the team at Canine Journal! Hi, I think the Turkemen Shepherds Dog, named also as Central Asian Dog or Turkish Dog should be in this list to. It is a wonder dog, which is very successful at many works such as breed watch, child watch, accompanied and house watch. And I consider that this breed is the ancestor of Anatolian shepherd dog. Looks very similar to Anatolian but, some higher and athletic and about the same head but a little bit larger. And more and very handsome. Because Anatolian shepherds, which are the main source of Turkish people immigrated to Anatolia with their stock and dogs from Central Asia. And here it developed to Anatolian Dog. And secondly Caucasian Dog as originally said Kavkazskaya Ovcharka, which is a little bit difficult for owner. The owner must be a good dog keeper. But fantastic clever dog and a very handsome fallow. By chance I owned both of them and I can say I never have had such clever and faithful, handsome and pretty working dogs. I learned something new the other day about dogs. I always found it funny that those real little dogs that annoy the crap out of me are the ones who act like they are the most vicious. I apologize if you love little dogs that you can carry in your purse, but every time I hear one bark like he's overdosed on speed, I just want to shove a pencil in my eardrum. But I digress. What I learned was that these little dogs have no idea that they are small. I'm not really sure how they figured out that particular nugget of information, but there it is. Since they don't know they are small, they aren't afraid to challenge the bigger dogs. I've seen big dogs back down from these little yappers and every time I do I think that the big dog must just be afraid that the little one has a serious mental health issue and could snap at any time. The result would be a little dog dangling from the big dog's neck or shins. To me that's right up there with the idea of a cat digging into my leg or something. It's not going to cause any real damage, but would be annoying as heck. Thanks, but I'll stick with dogs that won't fit in my purse! The Saint Bernard section brought back fun memories of watching the Beethoven movies and also brought to light the fact that large dogs do not live as long as other, smaller breeds do generally. This is part because of the health problems that large dogs are susceptible to. I heard in the past something about how large dogs have problems such as arthritis and joint pain and intestinal or organ issue, and who are just somewhat clumsy in smaller spaces and tend to hurt themselves. I also have experience first-hand with large dogs that drool a lot, a trait that can prove to be quite destructive to the home and can gross people out. It is also true that because large dogs require heavy exercise, they can sometimes become listless in the home during the day, and this can cause them to look for ways to entertain themselves that can be destructive. Therefore, as the article mentions, it is a requirement of having a large dog that you have at least enough space for the dog to move freely, as well as perhaps a dog door or dog house in the yard for your pets to run around in while you are away. I found this article to be quite informative. Better yet, I appreciated the way the material was laid out in an unbiased way, giving the positive and negative aspects of owning a particular breed of large dog. Some of the health effects that certain breeds are known for can end up being quite expensive, and this can be a great shock to a family financially if it comes as a complete surprise. That is also why I appreciated the section on responsible dog ownership and how you should have experience with dogs in general before adopting a large breed pet. But more than that, it also prepares you for the emotional impact of having an animal with health problems, as well as for the support you will need to give the animal in order to help him on a regular basis. Furthermore, the information on how different breeds of dog get along with children or other pets in the household is also quite valuable information. While every dog is different, choosing which breeds will more likely fit into your home is a great way to start narrowing down your choices when it does come time to adopt a new pet. Even if you are not currently considering a large breed of dog to be your new family pet, this article has good information that will help you to understand these types of dogs when you see them as well as how to have a more positive interaction with a large dog. Treat them respectfully and establish trust and authority in a kind way, and large dogs will be playful friends in any capacity. The article also shows a number of dogs which you might not have ever thought of. Please make sure to do thorough research before choosing such a large breed of dog as a pet. The Anatolian Shepherd is an interesting breed that I have heard a lot about before reading this article, and they are a beautiful and substantial large dog. It is so cool that Anatolian Shepherds are still used in places like Turkey to herd sheep. These dogs are very agile and skilled in what they do as well, unlike many dogs who are bred to work but do not have agility along with muscle stamina. I am curious as to whether there is a way to find a quality Anatolian breeder, to avoid adopting a pet who has some of the problems mentioned in the article. I think this is a common factor among the large dog breeds, as it seems that many of them have the characteristics they do because of people who inbreed them in the past. 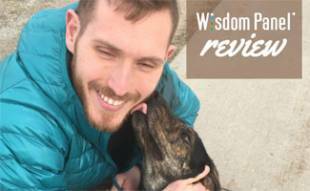 As the article touched upon, you need to be firm with boundaries and train these dogs well in order for a successful relationship. They are used to being in charge of the sheep and maintaining a territory, although with the proper training they can learn to over-ride these instincts and be obedient and attentive members of the family. The Great Pyrenees have such beautiful white fur and are such fabulous family dogs that it is hard to believe that they are not more popular. With similar cute faces as the Anatolian Shepherd, they are also agile and hard-working, and do not bark excessively. Great Pyrenees have heavy fur and do not get cold even in chilly climates, and are devoted guardians to the whole family. I have heard, however, that despite the Great Pyrenees devotion to the family, that if the owner does not set firm boundaries and positively and confidently enforce these boundaries, that the dog is liable to become quite stubborn and domineering. Take note of this if you are one of those people who does tend to treat the family dog the way you would treat a human family member, as for some breeds of large dog, this will not work. I was so glad to see the Large Black Newfoundland included in the article. These are giant, cute, furry love balls, and they look like a fisherman dog, just as they were bred. It sounds like this would be the perfect pet to go swimming with in addition to having around as a cuddly doggy. That said, it does seem that the Large Black Newfoundland are not aware entirely of their own size and power, which can be unsettling, especially to someone like me who does not have extensive training or experience with large dogs. This breed, unlike some of the herder breeds such as the Anatolian Shepherd, is less agile and slower moving. Of course, not all of these large dog breeds would make good pets. Actually, I suppose it depends on who is doing the choosing. Personally, I would never choose something like a Dalmation as a pet for a small child. I know many out there will disagree, but it is a common misconception that these dogs are good with children. The Great Dane, large but having very little fur in comparison, is seemingly completely different than the Black Newfoundland and known for being a leaner, which made me laugh. But I think this is true, and therefore it is probably also for the best if you are considering adopting a Great Dane to not have anything standing up or hanging at first that you would be devastated to lose or, if it does not get leaned on, at least that you would not be devastated if dog drool got on it. Among all the large breeds discussed, the Irish Wolfhound seems to be one of the best breeds to have around children. I wonder why it is that this particular breed is so self-aware of its size when in the company of humans, since it seems that other breeds are not really aware of how large they are. I learned a lot about breeds I was completely unfamiliar with from the updated section. I looked up more photos of the black Russian Terrier to get an idea about this large dog breed, because I was so unfamiliar with it. With the terrier part of the name, I automatically assume that from the name alone this would be a small dog, so I was surprised to read about how large they are. From the photos, they look like giant versions of the famous Cairn Terriers. The health concerns, including the different types of dysplasia that plague this breed, are a large detractor. Borzoi is another breed that I learned a lot about from the article that I was not familiar with before. These dogs have beautiful soft fur and elongated faces and are very noble acting. I have never seen one personally but I think they are a great, lesser-known large breed to consider, especially if you do not wish to own a dog that needs extensive rough play the way that many of the other giant breeds seem to. However, it is noted that the Borzoi also do not seem to succumb to as many of the health ailments that others types of dogs do that were discussed in the article. Though they can be scary, large dogs are beautiful and interesting creatures. Large dogs have a bad reputation sometimes for being dangerous or difficult to control, and I count myself as one of those who find themselves afraid of large dogs. I would like to work toward changing this, however, because I know many people who have large dogs and I also come across large frequently at the dog park. The large dogs that I have interacted with always seem gentle enough, but I have heard stories about some breeds attacking people while they sleep or destroying property and even hearing a large dog bark makes me afraid. This article definitely helped me with that because I feel that knowing about large dogs and why they are the way they are, as well as how to meet the needs and requirements that large dogs have, is a step in the right direction. It is quite interesting to hear that most of the breeds of large dogs were bred to be working animals, although it makes a lot of sense. It is even interesting to me that these are known as family dogs, since I would not think that at first. However, working animals tend to be obedient and tolerant, which would make them good around children, and because they are gentle these large dogs will probably not bite. Knowing what tasks each breed was bred for is also very important to know so as to give your dog the proper care.